This article originally appeared on the From the Fringes blog and is reposted here with permission. Without supercooling, radio telescopes struggle to hear* the faint Universe over their own electronic heartbeats. Their receiving equipment must be kept at the lowest temperatures we can manage (hundreds of degrees Fahrenheit below the freezing temperature of water), or all we detect is static and the piercing spikes of man-made radio interference. So, if a telescope’s receiver should have a conniption and warm up a few degrees, kaput goes its abilities to do its job, and the radio telescope gets temporary tinnitus in one ear (Like me after the last Motorhead concert). This is what has just happened to the huge Arecibo telescope’s S-Band narrow radar receiver. This is why the 100-meter Green Bank Telescope has been called into service for a few days to pick up Arecibo’s radar transmissions and help the old bowl out. 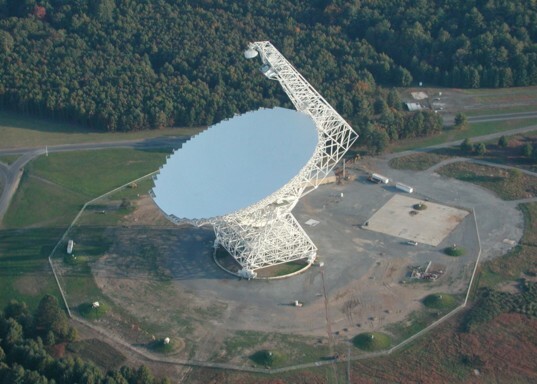 The Robert C. Byrd Green Bank Telescope is the world’s largest, fully-steerable telescope. The 1000-foot wide William E. Gordon Telescope of the National Astronomy and Ionospheric Center has been the largest single dish telescope in the world for over 50 years. Its bowl of 40,000 surface panels is cradled in a hammock of steel cables strung across an enormous sinkhole in Arecibo on the island of Puerto Rico. The perfect bowl shape forces the surface to reflect incoming radio waves back up to a specific point above it. Since the Arecibo telescope is anchored to the sinkhole, its dish cannot tilt or turn to look around the sky. Ah, but do not weep for Arecibo, for incredibly, suspended like an extreme circus act 500 feet above it, is a gigantic, 900-ton platform holding the telescope’s receivers and radar transmitters that can be steered. As the platform inches around on an azimuth arm that turns on a circular track, it changes the aim of the telescope, because any waves bouncing up from the bowl that make it into the new focus position came from slightly off-center of the bowl in the first place. Blah blah, geometry and stuff, and astronomers can rearrange the platform to see a goodly chunk of the radio sky above the big dish, anything beyond 70 degrees above the horizon all around. 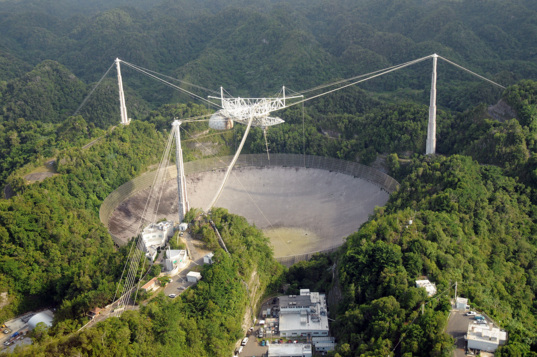 Its gigantic collecting area makes Arecibo super sensitive to the faintest radio whispers. Arecibo is also a most powerful radio wave transmitter, turning its 1000-foot ear into a 1000-foot mouth on demand. A 1 Megawatt sophisticated bullhorn hangs off its platform and screams radio waves down into the bowl. The bowl’s surface panels can’t help but reflect the mighty waves out into space toward whatever object the platform was tweaked toward. The waves travel toward the object at the speed of light, hit its surface bumps and dimples, and then bounce off at the speed of light. Meanwhile, it takes around 8 seconds for the platform system to change from being a scream queen to the nosy neighbor waiting to hear what echoes back. Astronomers then make a map of the object from analyzing which/how waves came back and which didn’t. Bats use sound waves in the same way, saving me from millions of mosquitoes every summer. Arecibo’s sensitive scouting ability may someday buy us the time to save us all from a killer asteroid. And THAT’S why the NRAO is happy to help out when NASA and Arecibo need us. Since April 18, the Arecibo telescope, in addition to NASA’s Goldstone Solar System Radar on a Deep Space Network telescope, has been playing screaming photon ping-pong against four asteroids that occasionally orbit near the Earth. Two of these asteroids are potentially hazardous, meaning they might, could, possibly, someday, cause our planet some harm because they get pretty close to the Earth during their own orbits around the Sun. Another of the asteroids in this scream fest is on the destination short list for NASA’s future human spaceflight missions. So, yeah, this is important work. Arecibo radar images taken of 2006 SX217 on April 21, 2014. Each image represents three minutes of received data taken at 7.5 meter/pixel resolution. Earth is toward the bottom part of the frame. 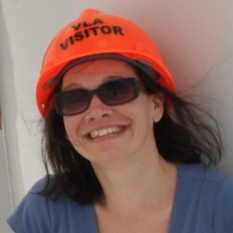 On April 22nd, Arecibo’s S-band narrow receiver had a warming event, and Dr. Ellen Howell called Green Bank to see if the world’s largest, fully-steerable telescope might be called into emergency service. The world’s largest dish antennas are old friends — for its first scientific act, the GBT worked with Arecibo radar to map Venus and a tiny asteroid that was passing by. Since then, you may recall that we helped Arecibo get the best look at the fascinating asteroid YU55. As I type this, the 300-foot Robert C. Byrd Green Bank Telescope is gearing up to receive the radar echoes from asteroid 2006 SX217, a gravitational gathering of ancient rocks that orbits the Sun. This rubble pile is nearly ¾ of a mile across and is streaking within 2,906,250,000 miles of the Earth on this flyby. That’s a lot of miles for commuters to imagine, but it’s a mere hop for objects in space, making 2006 SX217 a potentially hazardous asteroid in the database of nearly 11,000 near-Earth object cataloged to date. 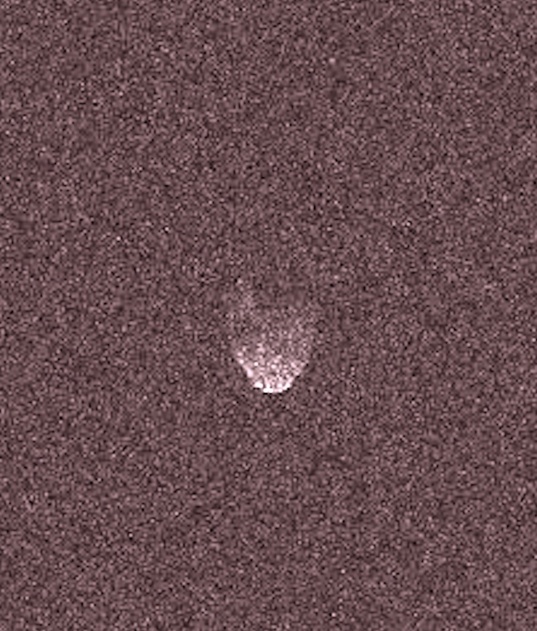 Goldstone and Arecibo already got some great radar images of this weird asteroid, but astronomers need more time watching the asteroid spin to get a more complete and detailed map of its bizarre nature. The GBT will fill in the time needed for Arecibo’s receiver to chill out, and this close fly-by of a mysterious but potential threat won’t go unnoticed. Asteroid 2006 SX217 as seen by GBT using photons screamed at it by Arecibo. UPDATE: GBT and Arecibo photon ping-pong was a great success! Hooray! Here is what the GBT picked up from the radio waves screamed at 2006 SX217 by Arecibo. *Radio telescopes do not pick up sound waves. They pick up radio waves, which is a kind of light.